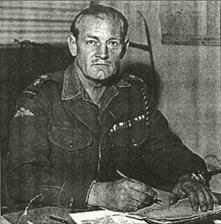 Lieutenant Colonel John Malcolm Thorpe Fleming "Jack" Churchill, DSO & Bar, MC & Bar (16 September 1906 – 8 March 1996), nicknamed "Fighting Jack Churchill" and "Mad Jack", was a British soldier who fought throughout World War II armed with a longbow, arrows, and a Scottish broadsword. Born in Hong Kong to English parents and educated at King William's College on the Isle of Man, Churchill graduated from Sandhurst in 1926 and served in Burma with the Manchester Regiment. He seems to have spent a good part of his spare time riding a motorcycle around the Indian subcontinent and, even though he wasn't Scottish, he started learning to play the bagpipes. There's a claim he used his talents at the pipes and archery to play as an extra in the 1924 movie the Thief of Bagdad. He also apparently did some work as a male model. In 1936 he left the army to work as a newspaper editor and went on to represent England in the Archery World Championship in 1939. When Germany invaded Poland he resumed his commission with the Manchester Regiment. In in one of his first actions in May of 1940 his unit ambushed a German patrol in France. Churchill gave his men the signal to attack by taking down the enemy sergeant with an arrow and is the only British soldier known to have killed an enemy soldier with a longbow during World War II. But as the German Blitzkrieg swept across France, the British were being pushed back and were attempting to do what they could to stall the German advance. Churchill is said to have lead his unit in small guerrilla/surprise attacks. Some of these are said to have included Churchill riding a motorcycle and armed with nothing but his bow and arrows and a Scottish basket-hilted broadsword. When asked by a fellow officer he supposedly replied, "In my opinion, sir, any officer who goes into action without his sword is improperly dressed." He later volunteered for Commando Duty and was in command of No. Commando in a raid on a German garrison in Norway in 1941 and "Mad Jack" is described as having leapt from the landing craft to play his bagpipes before throwing a hand grenade and running to join the battle. In 1943 he led a commando mission from a landing site in Sicily again with his broadsword at his waist, longbow and arrows on his back and bagpipes under his arm. During a similar landing in Salerno his unit was ordered to deal with an artillery battery garrisoned in a town that greatly outnumbered his squad. His 50 men charged the town from all sides in the middle of the night and the surprised Germans were overwhelmed. They took 136 German prisoners and inflicted and unknown number of casualties. "I maintain that, as long as you tell a German loudly and clearly what to do, if you are senior to him he will cry 'jawohl' and get on with it enthusiastically and efficiently whatever the situation"
In 1944, he led the Commandos in Yugoslavia, where they supported the efforts of Josip Broz Tito's Partisans from the Adriatic island of Vis. In May, he was ordered to raid the German held island of Brač. He organized a motley army of 1,500 Partisans, 43 Commando and one troop from 40 Commando for the raid. The landing was unopposed, but on seeing the eyries from which they later encountered German fire, the Partisans decided to defer the attack until the following day. 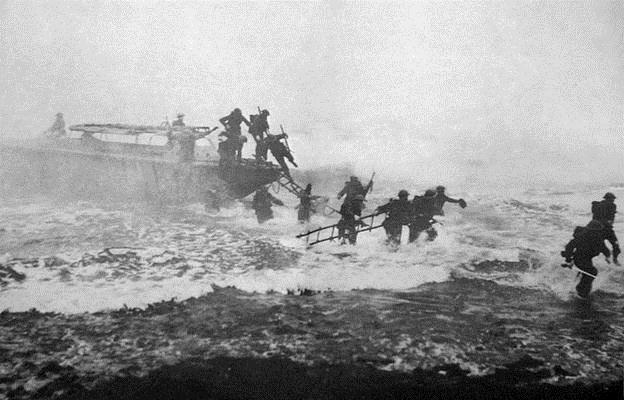 Churchill's bagpipes signaled the remaining Commandos to battle. After being strafed by an RAF Spitfire, Churchill decided to withdraw for the night and to re-launch the attack the following morning. The following morning, one flanking attack was launched by 43 Commando with Churchill leading the elements from 40 Commando. The Partisans remained at the landing area. Only Churchill and six others managed to reach the objective. A mortar shell killed or wounded everyone but Churchill, who was playing "Will Ye No Come Back Again?" on his pipes as the Germans advanced. He was knocked unconscious by grenades and captured. He was later flown to Berlin for interrogation and then transferred to Sachsenhausen concentration camp. In September 1944, he and a Royal Air Force officer crawled under the wire through an abandoned drain and attempted to walk to the Baltic coast. They were recaptured near the coastal city of Rostock, a few kilometres from the sea. In late April 1945 Churchill and about 140 other prominent concentration camp inmates were transferred to Tyrol, guarded by SS troops. A delegation of prisoners told senior German army officers they feared they would be executed. An army unit commanded by Captain Wichard von Alvensleben moved in to protect the prisoners. Outnumbered, the SS guards moved out, leaving the prisoners behind. The prisoners were then set free. After the departure of the Germans, Churchill walked 150 kilometres (93 mi) to Verona, Italy where he met an American armored force. As the Pacific War was still ongoing Churchill was sent to Burma, where the largest land battles against Japan were still raging, but by the time he reached India, Hiroshima and Nagasaki had been bombed, and the war abruptly ended. Churchill was said to be unhappy with the sudden end of the war, saying: "If it wasn't for those damn Yanks, we could have kept the war going another 10 years." In 1946 Twentieth Century Fox was making Ivanhoe with Churchill’s old rowing companion Robert Taylor. The studio hired Churchill to appear as an archer, shooting from the walls of Warwick Castle. After World War II ended, Churchill qualified as a parachutist, transferred to the Seaforth Highlanders, and later ended up in Palestine as second-in-command of 1st Battalion, the Highland Light Infantry. In the spring of 1948, just before the end of the British mandate in the region, Churchill became involved in another conflict. Along with twelve of his soldiers, he attempted to assist the Hadassah medical convoy that came under attack by hundreds of Arabs. Following the massacre, he coordinated the evacuation of 700 Jewish doctors, students and patients from the Hadassah hospital on the Hebrew University campus on Mount Scopus in Jerusalem. In later years, Churchill served as an instructor at the land-air warfare school in Australia, where he became a passionate devotee of the surfboard. Back in England, he was the first man to ride the River Severn’s five-foot tidal bore and designed his own board. In retirement, however, his eccentricity continued. He startled train conductors and passengers by throwing his attaché case out of the train window each day on the ride home. He later explained that he was tossing his case into his own back garden so he wouldn’t have to carry it from the station. He finally retired from the army in 1959, with two awards of the Distinguished Service Order, and died in Surrey in 1996.